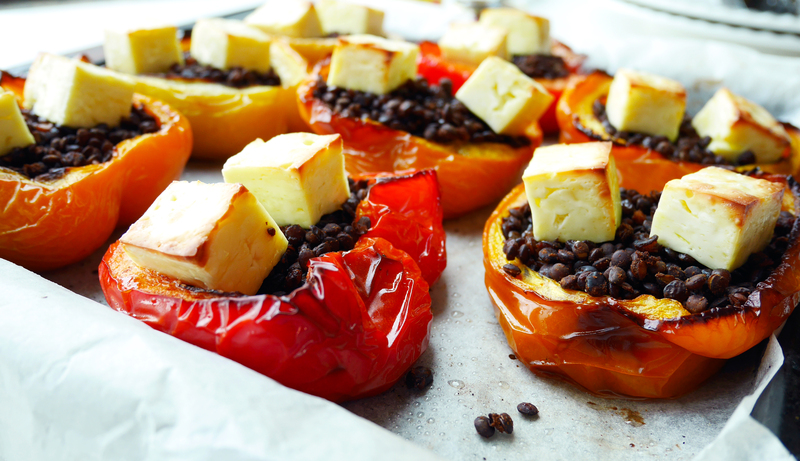 One of my absolute favorite things to cook for the last few months has been roasted bell peppers. My mom always makes me eat them fresh and raw back home, (which isn’t too bad) but roasting really does bring out all the natural sweet juice and flavor from them, and I think it is the best way to eat bell peppers. I never use green peppers though, because these unripe peppers are not as sweet as other ones even when they are cooked. 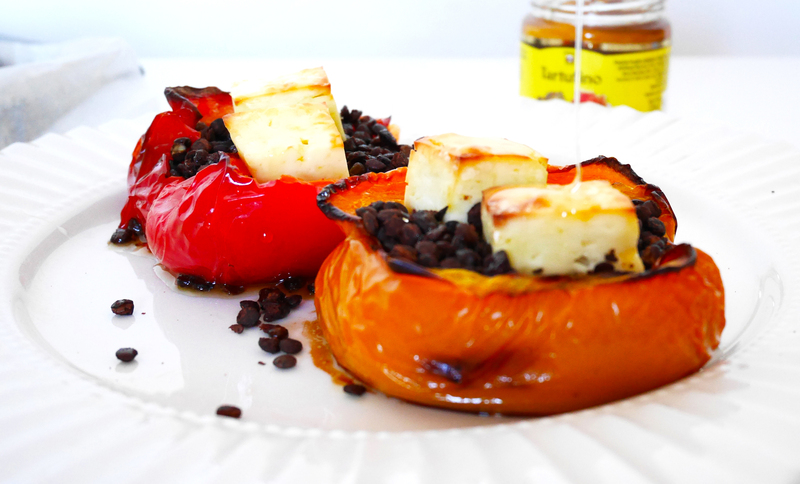 Initially I was going to post a recipe for quick and easy spiced roasted peppers and halloumi. Then I accidently found a pack of amazing French green lentils that I didn’t even know I had on the shelf. 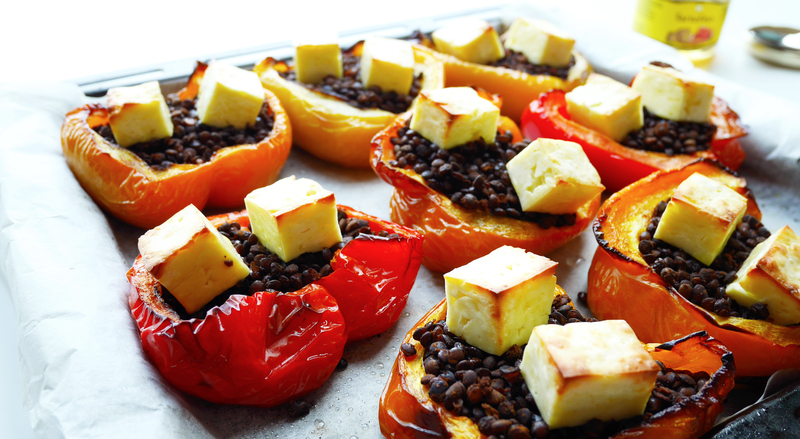 Being an impulsive cook, I decided to play with it a little and stuff my beautiful peppers with spiced lentils instead. These lentils absorb flavors fantastically and still have the crunch bite that goes so well with delicate soft peppers. And the salty squish halloumi with honey on top is just a winning combination. 1. Cover lentils with 3 cups of water in a pot over high heat. 2. Add smoked paprika, cumin, and garlic powder. 3. Season with a pinch of salt and pepper. Go easy with salt, as halloumi is quite salty. 4. Bring it to a boil, then turn the heat down to medium. 5. Simmer for 25-30 minutes, or until all the liquid has been observed. Stir occasionally. 6. 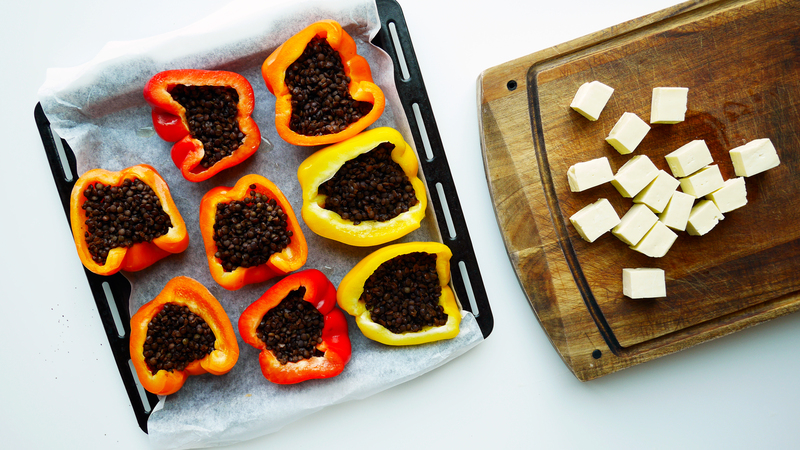 While lentils cooking, cut halloumi into bite size chunks. 7. Halve peppers lengthwise. Remove the green stems and seeds from inside. 8. Coat them (inside and out) with olive oil. 9. Pre-heat oven to 180c. 10. Place non stick cooking paper on a sheet pan. Arrange halved peppers on top. 11. When lentils are cooked, take them off the heat. Let cool for a few minutes. 12. 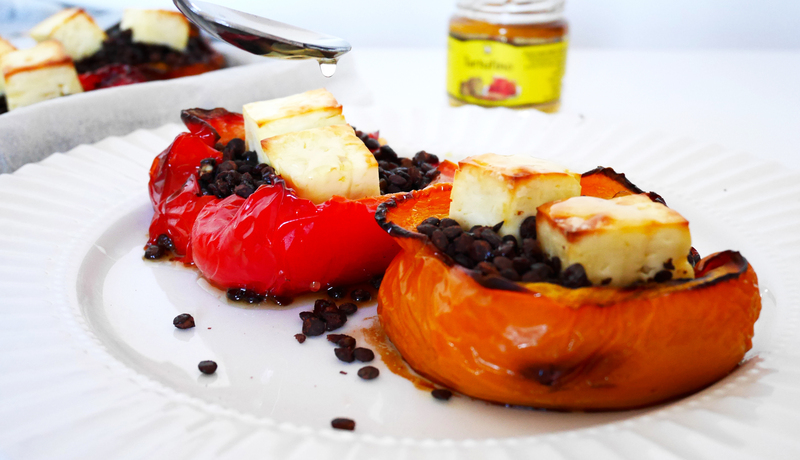 Spoon over lentils into peppers. 13. When the peppers haven been cooked for 25-30 minutes, add halloumi. 14. Cook for another 15-20 minutes or until halloumi chunks are golden on top. 15. Add a few drizzles of honey and serve. Yes, can’t go wrong with halloumi 🙂 Thanks Petra!